I had a crazy quilt that I loved, but it was getting old—so old that I was afraid to wash it again because I thought it would disintegrate. I couldn't part with it. 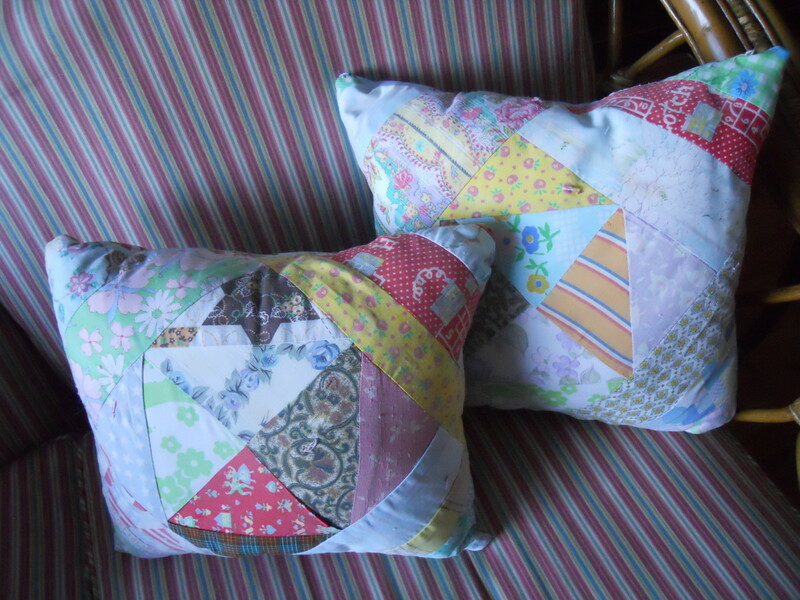 I came up with the idea of cutting up the crazy quilt and using only the good parts to make throw pillows for my home. (Shown in the adjacent photo). It was so easy and fun to do. 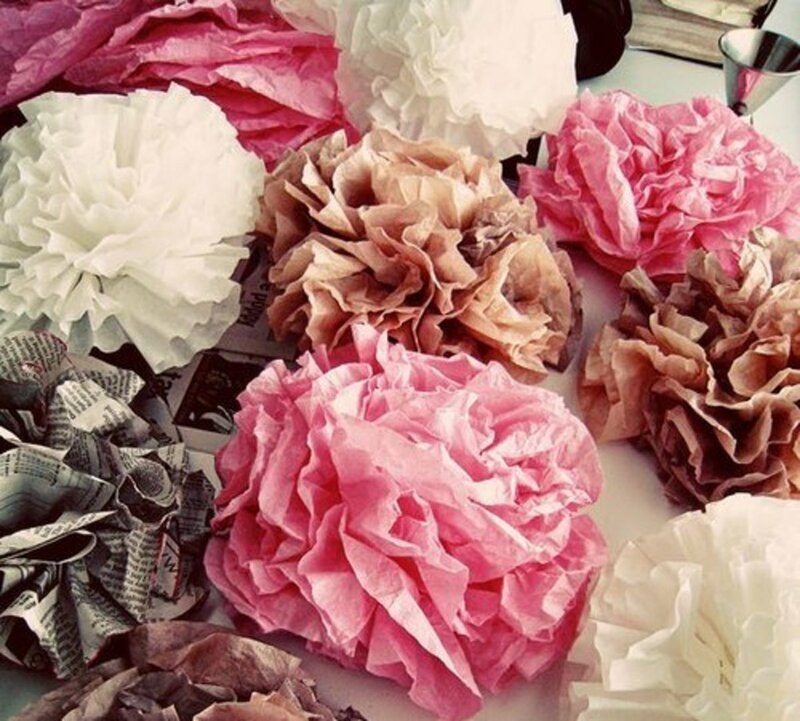 Think of all the beautiful items you have around the house where the fabric is torn or ripped. Maybe the items became stained or faded in the sun. Chances are there are still parts of the fabric with enough usable yardage to make a throw pillow. I found a beautiful vintage handkerchief tucked away in a drawer. I made a pillow with it too! The instructions for both the quilt and handkerchief pillow are simple enough that anyone can make one easily. It's better if you have a sewing machine, but it'll work if you don't. It will just take a little longer to do by hand. Find a quilt to use. I looked for areas where my quilt wasn't worn. 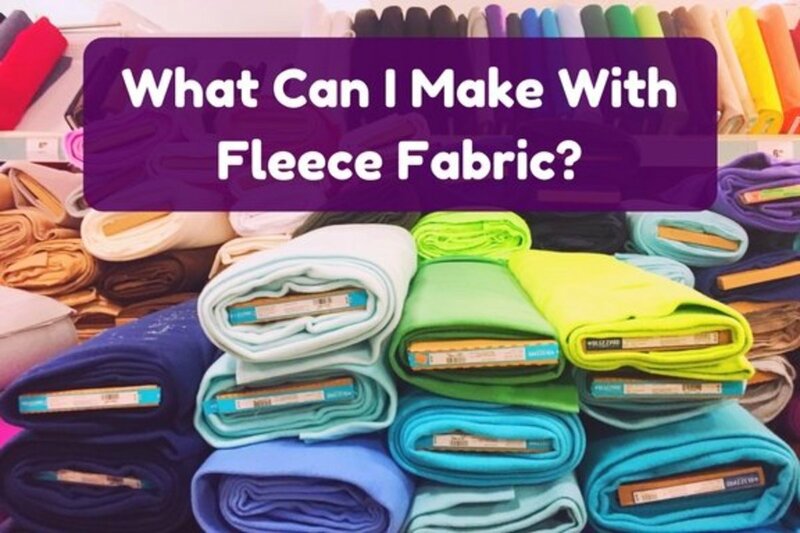 Measure and cut two pieces of fabric to the size you want. I cut along the square/rectangular pattern lines using the template I've included above. I also purchased fabric for the back of the cushion that I felt was suitable for a crazy quilt and cut it to match the front. Find the filling. I made several pillows and as each shape was going to be irregular, I opted to make a pillow stuffed with filling rather than using a foam form. 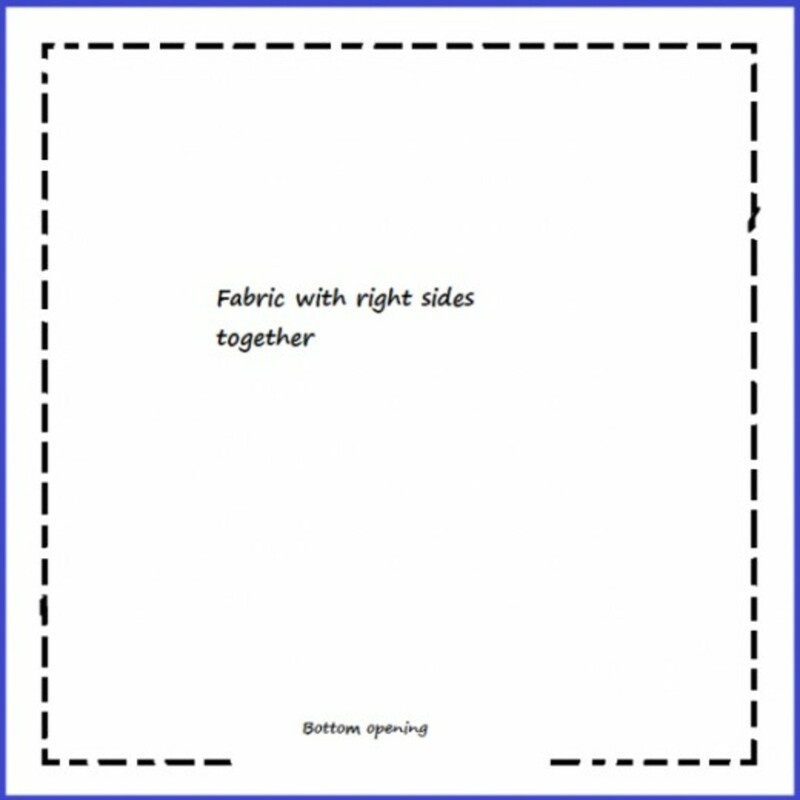 Put the fabric right-sides together. Sew on a sewing machine along the lines 3/4 inch from the edges. Leave an opening at the bottom wide enough to fit your hand into (as shown in the template). When the sewing is complete, turn the fabric inside out and stuff the cushion. Start first by getting the stuffing into the two upper corners so you will have a nice solid fill. When the cushion is at its desired fullness, fold in the edge at the opening, pin it down, and hand sew it closed. I suggest using an overcast stitch. Carefully clip the corners at an angle—just a little. Refer to the template above with the red line. Cut enough to remove the tip of the corner so they don't look lumpy. 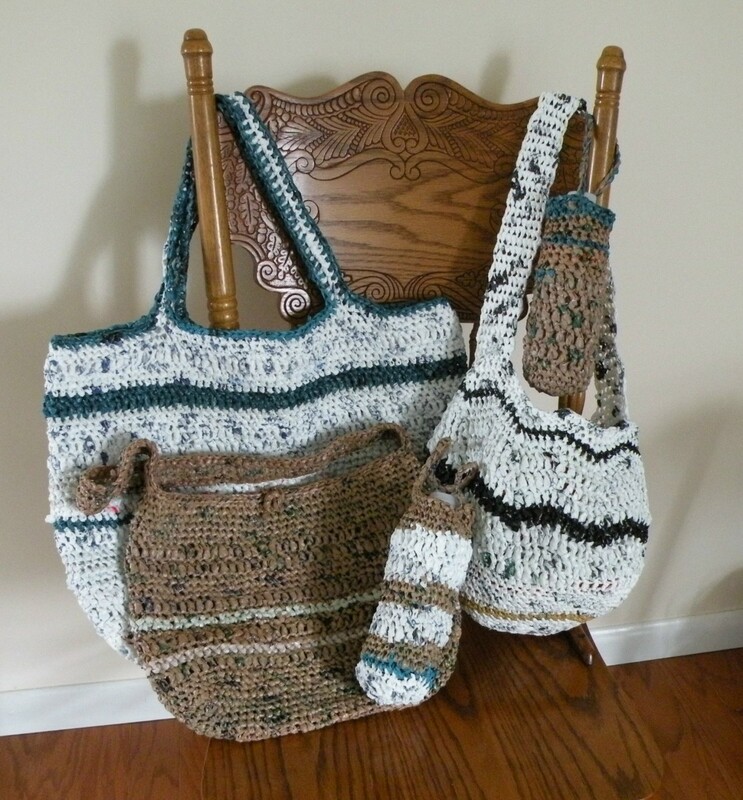 Make sure to leave enough room so your stitches don't unravel. Then, press all the seams open. This will make for a flatter finish when you turn the fabric right side out. This handkerchief pillow is easy to make and a great way to display your often unused vintage pieces. I think many vintage handkerchiefs are beautifully designed or embroidered and that all of them should be displayed. 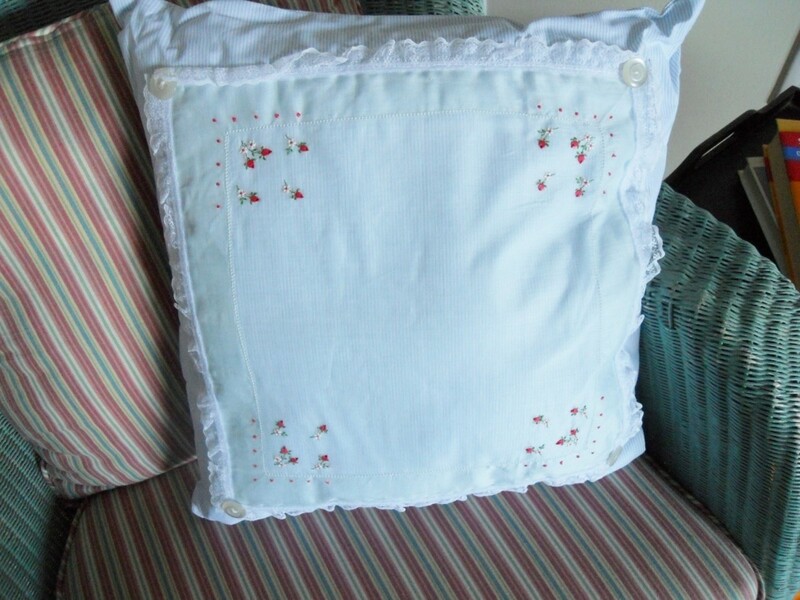 The finished pillow makes a great frilly accent for a little girl's room or a girly-girl adult's room. It will fit in wonderfully with any traditional decorating theme as well as a shabby chic theme. My handkerchief is very sheer and a light pale blue color with little embroidered red roses. While my handkerchief has a symmetrical design, many just have a design in one corner. 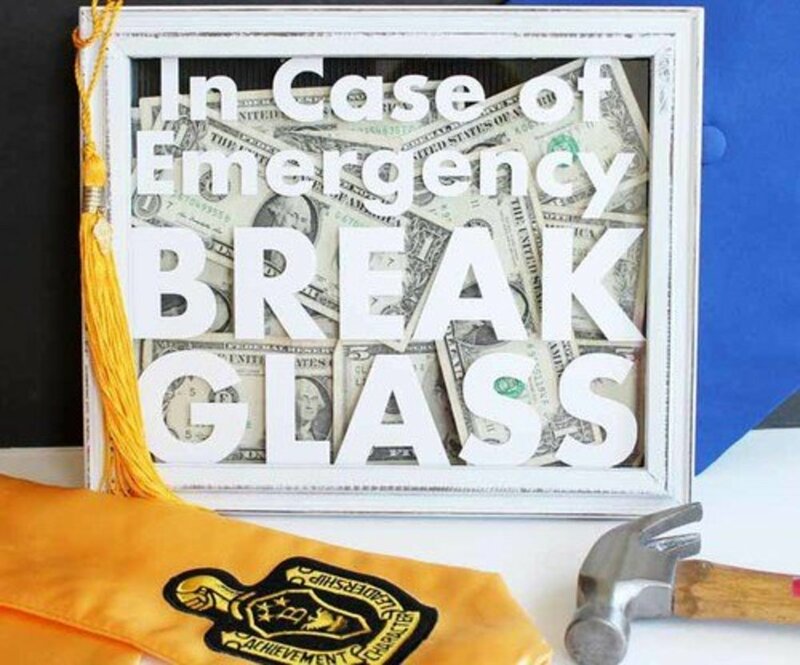 I believe these could work just as well. You could make the pillow with a design in one corner and when you set it up, turn it on a corner and use it as a diamond-shaped pillow rather than a square. For my fabric, I selected a polished cotton with a white background and fine blue pinstripes. I used the same fabric on both the front and back. Fabric for the front and back of the pillow. 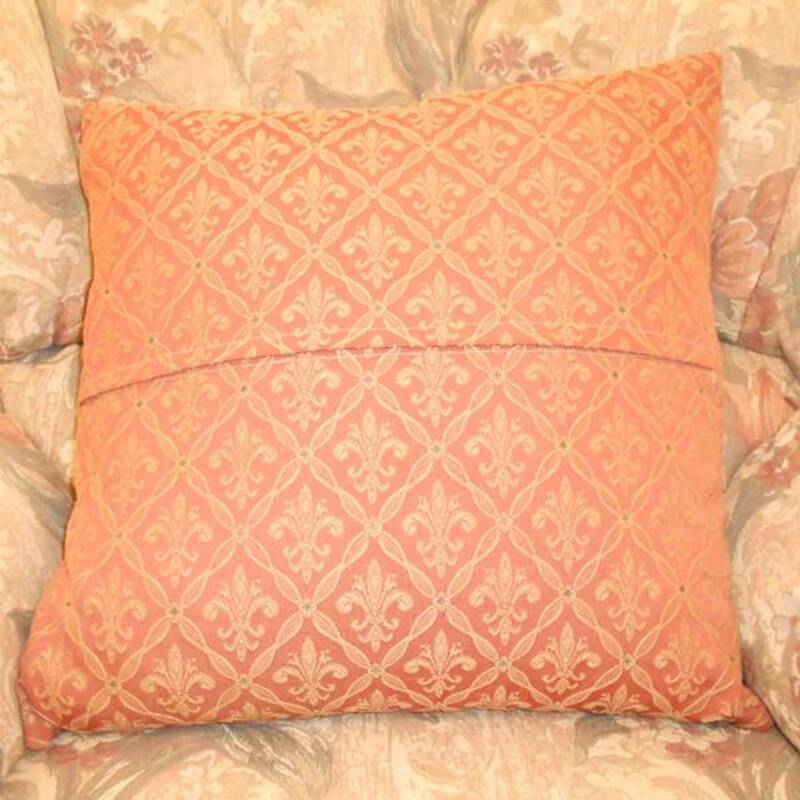 If you want to make an 18 X 18 inch pillow you will need a 1/2 yard (18 inches) of 36 inch wide fabric. Of course, if you want to make a smaller pillow, this is also an adequate amount of fabric. 4 Buttons (optional). I used buttons as trim. You may leave them off or use something else. The steps are the same as the ones for creating a cushion from a quilt. The only difference is the way you finish the pillow: adding snaps instead of sewing it closed. When you put the pillow form into the cushion, work it in carefully. You'll end up with a full decorative pillow! I carefully tacked (sewing stitch) a vintage handkerchief it to the top fabric without going through to the pillow insert. I hand-stitched lace around the edges of the handkerchief and sewed four vintage buttons to the corners. Feel free to decorate it however you like! 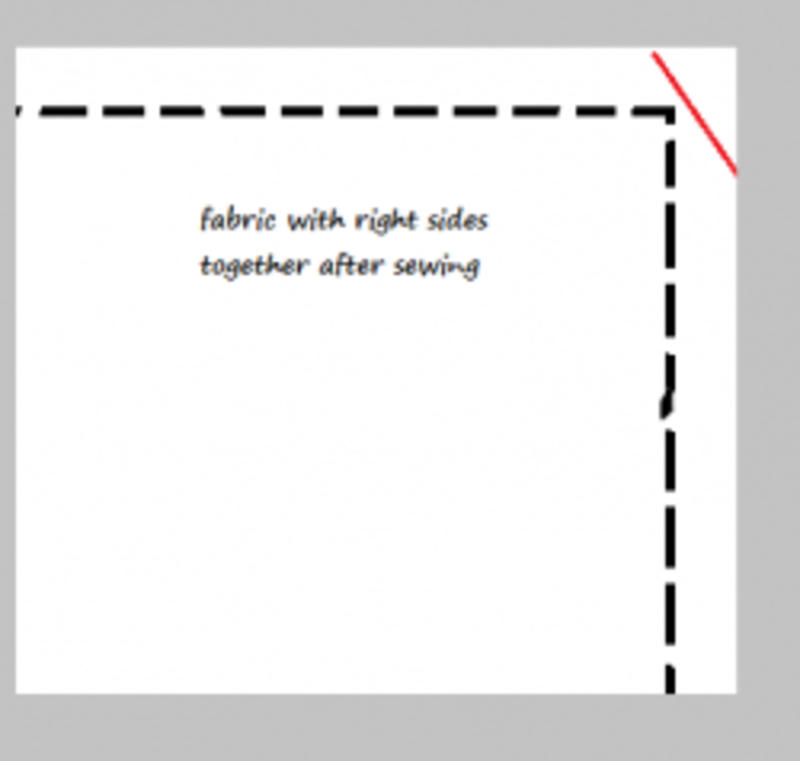 Fold in the 1/2 edge and sew snaps to either side of the opening (about 3 will do). This will make the pillowcase removable. Here are two different options to finish off your pillow. Just sew the pillowcase shut. This, however, means that you won't be able to wash the cushion without removing stitches. Put snaps on the opening to make the pillowcase removable for washing. Given the delicate nature of most vintage handkerchiefs, as well as the light color, I chose to make my cover removable for hand washing. What a great way to redo your old pillows. This was a helpful reminder. I was just thinking about making some pillows. I'm like you on hating to get rid of tattered quilts. 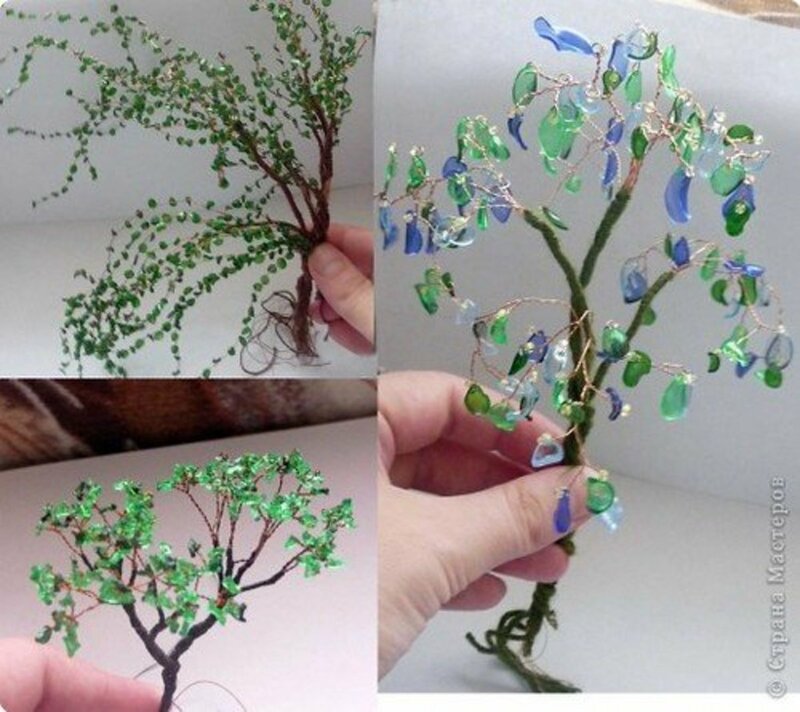 They are great to reuse for smaller projects. This is a wonderful idea, thanks for sharing it. Happy Labor Day to you, Squidoo friend! I hope you're having a great day. Very interesting and nice lens! This sounds like such a nice idea.